The original ANDERIC RRVUR6 Vizio Remote Control is in-stock and ships within 24 hours. The original ANDERIC RRVUR6 Vizio Remote Control carries a 1-Year Warranty. 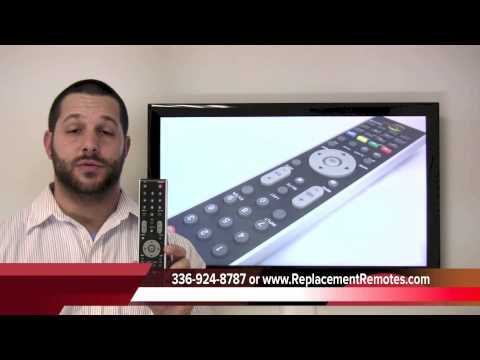 The Anderic RRVUR6 remote control replaces much original equipment Vizio TV remotes. The RRVUR6 will work right out of the package for compatible Vizio TV models listed (but not limited to) without any programming. The RRVUR6 is a pre-programmed Vizio TV remote and cannot be programmed to any other devices. The remote includes popular features like MENU, INPUT and of course, all other buttons for normal operations. For detailed information on how to use this product with your TV, please refer to your TV's operating manual. This remote comes with a manufacturers 1-Year Replacement Warranty. NOTE: This remote does not have the "-" button. for use with accessing digital channels. This remote works great. Simpler to use than the original, is a bit heftier than the original. I like that, it should survive our household better than the originals! by Harry on February 03, 2019. This replaced the original remote and works perfectly, plus great price and super fast delivery. I'd recommend dealer and product to a friend. by Duane on September 17, 2018. Great, works without any problems. by Debbie on April 05, 2019.
by Deborah on March 10, 2019. I just put in new batteries and voilà! It worked. No programming needed. It works great! I would definitely recommend this product. by Agustin on February 25, 2019.
by H. on February 23, 2019. Put batteries in and worked perfectly for my old Vizio 46 inch LCD. by Robert on February 09, 2019. Works better than the original Vizio ever did. by Rudy on February 08, 2019.
by Marcus on January 19, 2019. The remote came quickly and worked perfectly. Even the TV Menu and quick keys all work. I saved so much money over the OEM (Original Equipment Manufacture) one. Thank you. by Robert on January 16, 2019.
by ARTHUR on November 29, 2018. My TV remote stopped working. I ordered this replacement solely to change the input so I don't have to do that manually because it is annoying. I just received the remote. It works just as I needed it to do. So I am happy! by Linda on October 29, 2018. Arrived earlier than expected. It was ready to use with no setup. Works great. by Judy on October 09, 2018.
perfectly working as expected. Better than the original Vizio remote control. by Edward on October 08, 2018.
by Andrew on October 04, 2018.
by John on September 24, 2018.
i love it i love the buttons for switching from TV to AV to HDMI etc. What a nice convenience. by Lorraine on September 11, 2018. I like it better than the original one because it's thicker in size. It's a better design then the original. by JEFFREY on August 29, 2018. Perfect replacement for original Vizio remote, Shipped immediately, great customer service response when I called to add item to my order. by Anne on August 29, 2018.
by Lourdes on August 19, 2018.
by Theodore on July 22, 2018.
by Joe on July 17, 2018. Exact replacement and received quickly!!!!!! Good show, y'all!!!!!!!!!!!!!!!!!! by Lyle on July 05, 2018. Perfect! Couldn't be happier with this purchase. Item worked right out of the box without any issues whatsoever. Fair price, great communication and fast shipping. I would shop here again. Thanks! by Lisa on January 08, 2018. An instruction manual would be helpful, but it does the job. by harris on November 29, 2017. Works perfectly for my Vizio TV. No setup required. by Michael on November 17, 2017.
by Robert on November 14, 2017. It works! We really appreciate the color coded HDMI button. We switch between HDMI ports a lot and it was always hard to see on the OEM remote. by Kent on November 13, 2017. Perfect item priced great work like a charm. No complaints just thanks. by stanley on November 07, 2017.
by James on October 25, 2017. Works out of the box. Wish it came with a user manual. Excellent!! by John J on September 22, 2017. Arrived on time and functions as the original remote. Great service! by Brian on August 29, 2017. Fast, excellent Service, quality product and exactly like the original and works perfectly. The price was very reasonable. by Doug on August 23, 2017. Just installed batteries and remote works great. by Terry on August 10, 2017. Works great, just like the original. Several buttons in different location than original, but same functions for basic TV operation and setup. Excellent website for Remote replacement, I've purchased several from Replacement Remotes, all 100% compatible, 100% satisfied. by Thomas on August 04, 2017. It works. The buttons need to be mashed hard, but it works. And that's all that matters. by Daniel on August 01, 2017.
by JAMES D on July 12, 2017. Not a 100% direct replacement for the Visio VUR9, but pretty darn good. Is working well! by Helen on June 17, 2017. Layout not identical to original, but it works. by ted on June 07, 2017. Works great, arrived on time. I highly recommend this company! by Beth on June 02, 2017. Worked right out of the box. Fast shipping. I highly recommend! by Theresa on March 16, 2017. Great Remote Control. Great Quality Product! by Louise on February 16, 2017.
by RENEE on November 06, 2016.
not lighted but works well. by michael on October 29, 2016.
by Norman on October 26, 2016.
by Barbara on October 18, 2016. The remote arrived promptly and is working great! by Jeff on October 12, 2016.
by William on October 09, 2016.
by jill on October 04, 2016. Great option over the OEM remote at one third the price. by Richard on October 03, 2016. This item is great! Just put in Batteries and it worked with our TV right out of the box! This was a great purchase and very thankful to be able to purchase this remote from you. The TV was stuck on a Zoom setting and no other remote or any of the TV settings on the TV itself would fix it. We was able to fix it with the remote. I would purchase and recommend buying from this company! by Jeanette on September 27, 2016. Wonderful! I put the batteries in and it functions just like the original. The price is much better than anywhere else. I definitely recommend it. I could not ask for anything better. I was surprised that it only took a couple of days to arrive. This will be my first stop next time I am in the market for a remote! by Theresa on September 21, 2016.
starting working right out of packaging. works great. perfect replacement. Extremely happy. and price was fantastic!!! by Karen on September 15, 2016.
by larry on September 14, 2016.
by Patricia on September 12, 2016.
by Li on September 05, 2016.
by Joseph on August 29, 2016.
by steven on August 21, 2016.
by charles on August 13, 2016. Worked perfectly immediately! Great product! Thank you! by Joseph on August 07, 2016. Works perfectly. Great replacement. More sturdy than the VUR9 remote. by Benjamin on July 29, 2016.
by Diane on July 25, 2016. Awesome, no issues with any of the buttons at all. by Cornelius on July 19, 2016.
by Jeff on July 11, 2016. They delivered what they promised. I am completely satisfied. by Doug on July 07, 2016.
by Chris on June 04, 2016. Excellent replacement. Easy to use. Very happy with quality. by Sara Lee on June 02, 2016. Worked perfectly as the replacement for a VIZIO TR3. Key pad layout a bit different but not enough to be a bother. Seems better constructed than the original. Recommended. by Mark on May 30, 2016. Bought 2 in the past few months. Excellent and fast service. They work perfectly. Definitely 5 stars. by Steve on May 29, 2016.
worked rite out of the box - fast delivery - I was happy to do business - thanks! by Frank on May 26, 2016.
by Guy on May 26, 2016. Just what we needed after dog ate the original! by Ursula on May 25, 2016.
it functions as it is suppose to. everything we hoped for. thanks for your service in a time we really needed it. by suzanne on May 23, 2016. It's wonderful and already programmed. Keep up the good work. by Carrie on May 18, 2016. Excelente works really well l'm happy. by Joel on May 18, 2016.
by Chris on May 18, 2016.
by claudette on May 13, 2016. Worked as well as I had hoped for an out of date vizio remote. by Anonymous on May 01, 2016.
quality of replacement remote is very good. would recommend to anyone. I have used replacemantremotes.com several times and have always been satisfied with the product, the service and the delivery. Recommend them to anyone needing remote replacement. we ordered a visio remote replacement that our cat accidiently knocked in the trash.It works just fine. I looked at Walmart and was confused with what they had.So I looked up on the internet and found you. Ordered late in the day and it was here before the expected day of delivery. we are so happy now. by Anonymous on March 06, 2016. Remote arrived quickly, was wrapped well, & it works! by Anonymous on November 08, 2015. Excellent remote shipped very quickly! Thanks! by Anonymous on November 07, 2015. Order arrived on schedule and worked properly as soon as the batteries were installed. Appears to be a good choice for the price. by Anonymous on October 21, 2015.
the remotes arrived in 3 days-and they work better than the factory originals. by Anonymous on September 24, 2015. Turned the tv on, usually the TV has to be on and then use a replacement to turn it off to verify the programming. by Anonymous on September 19, 2015. The remote was delivered on time and worked! by Anonymous on September 09, 2015. Great product, great service-you fill a sorely needed niche! by Anonymous on September 02, 2015.
by Anonymous on June 05, 2015.
by Anonymous on May 25, 2015. The TV remote replacement is perfect. Service was excellent, prompt, too! by Anonymous on May 16, 2015. Excellent experience in receiving proper information to purchase the correct remote. Arrived when expected and works just fine. Will use this company in the future when needed. by Anonymous on May 09, 2015.
by Anonymous on May 05, 2015.
by Anonymous on January 08, 2015.
by Anonymous on January 04, 2015. Fast delivery, item exactly as listed. by Anonymous on December 30, 2014.
by Anonymous on December 28, 2014. The remote works just fine and it seems to be of good quality. by Anonymous on November 17, 2014.
by Anonymous on November 07, 2014. The product met my needs. by Anonymous on October 28, 2014.
by Anonymous on October 20, 2014. The remote is easy to use, works great. by Anonymous on October 10, 2014. Remotes worked great straight out of the box and replaced our discontinued remotes for our Vizio TVs. by Anonymous on October 09, 2014. When i decided to drop satellite service for roku I could find my Vizio tv remote. So i ordered this model and it worked perfectly. by Anonymous on October 08, 2014.
toi replace defective remote that came with the T.V. by Anonymous on September 09, 2014. Used as tv remote. Would recommend to family and friends. Hope it is good quality,time will tell. The OEM remote is poor quality. The remote replaces the original that came with our TV purchased at Costco. It has almost all of the functions of the original, so I recommend it as a good, inexpensive replacement. by Anonymous on August 01, 2014.
by Anonymous on July 26, 2014.
by Anonymous on July 20, 2014. This interactive feedback process has asked me to repeat my rating and comment. by Anonymous on July 03, 2014.
by Anonymous on July 01, 2014. I already wrote a lenghty review stating that I like the product very much and would recommend it to anyone and everyone. by Anonymous on June 21, 2014.
by Anonymous on June 19, 2014. We use the remote primarily to turn on the tv and adjust the volume. by Anonymous on June 13, 2014.
by Anonymous on June 10, 2014. I use this remote for a *** 42 TV. This replacement actually works better than the original. by Anonymous on June 03, 2014. Quality appears good and shipment is quick. by Anonymous on May 31, 2014. Replaced original remote which had failed. Replacement remote worked as expected. by Anonymous on May 16, 2014.
by Anonymous on April 28, 2014.
by Anonymous on April 25, 2014.
by Anonymous on April 21, 2014. Perfect replacement for our bedroom TV. by Anonymous on April 14, 2014. Excellent product, better than the OEM remote. by Anonymous on April 07, 2014.
by Anonymous on April 05, 2014. The quality of the remote is comparable to the original. If you need a replacement or just a back-up remote, this is the place. by Anonymous on January 30, 2014.
by Anonymous on January 28, 2014.
by Anonymous on January 27, 2014. The product is a replace remote control for one of our televisions. Great remote. Better than the original. Great service. Friendly and helpful order support. Highly recommended. by Anonymous on January 15, 2014. We use the remote with our Vizio TV and I think works even better than the original device. TV remote worked exactly as described. by Anonymous on January 10, 2014.
by Anonymous on January 08, 2014. Remote works perfect. Just what I needed. No programming and all that stuff. by Anonymous on January 03, 2014. Found you online and it was easier than ever. Thanks. by Anonymous on December 25, 2013.
by Anonymous on December 19, 2013. Replacement remote in pristine as-new condition. I would recomend this remote to anyone. This is the only website that I could find a Vizio remote replacement. Easy to order, good price and speedy delivery. by Anonymous on November 21, 2013.
by Anonymous on November 13, 2013. Used at home for personal use on the TV only. by Anonymous on November 12, 2013. Tv remote works great came with quality batteries. by Anonymous on October 25, 2013.
by Anonymous on October 11, 2013.
by Anonymous on October 07, 2013. Remote control works perfectly with our TV. I am very pleased and the price was just right. by Anonymous on September 22, 2013. Although the replacement remote has a different appearance, it functions just as well as the failed original remote. by Anonymous on September 18, 2013. Ordered/received a replacement remote and I am happy with it so far. I'm giving it 4 stars only because I haven't had the product very long. It does seem a bit more user-friendly than the original remote. by Anonymous on September 14, 2013. Remote works perfectly. Like it more than original.Very satisfied. by Anonymous on September 06, 2013.
by Anonymous on August 29, 2013. The remote did have an upgraded design the only thing that didn't match up with the orginal remote was the keys on the remote didnt light up when pressed. That feature was nice for nightime use. by Anonymous on August 14, 2013. Nice quality. Would recommend to family and friends. by Anonymous on August 13, 2013.
by Anonymous on August 11, 2013.
by Anonymous on July 29, 2013. I would recommend this remote to anyone needing one like I did to replace a remote from a tv model you can't get one from any more. This remote was better than the one that came with my television. by Anonymous on July 18, 2013. The remote works beautifully. Makes me wonder why I waited so long to replace the one that hasn't worked well in a long, long time. by Anonymous on June 21, 2013.
by Anonymous on May 22, 2013.
by Anonymous on May 15, 2013.
the product is exactly the one I need. It works perfectly with my Vizio TV. by Anonymous on May 13, 2013. My replacement remote is a perfect match, Thank you! by Anonymous on May 08, 2013.
by Anonymous on May 03, 2013.
by Anonymous on April 30, 2013. This remote replaced our OEM one that had been failing for close to a year. It has all the buttons needed and actually reorganized some of the key buttons to be more ergonomically available to your fingers. This remote is lighter than the OEM one, but definitely of like or higher quality. The response of the buttons is also very accurate. I'm thinking of ordering another one just in case. by Anonymous on April 25, 2013. For less than $10 you can't beat this deal. Works just as advertised and much better than a universal, since you don't have to worry about reprogramming when it's time to change batteries. by Anonymous on March 10, 2013.
by Paul on September 11, 2018.
by Mark on September 21, 2016.